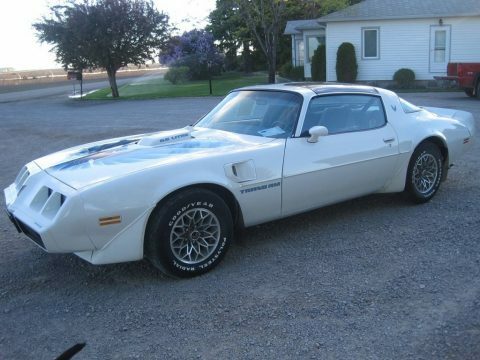 1979 Pontiac Trans Am For Sale in American Falls, Idaho 83211 Look out muscle car enthusiasts! This 1979 Pontiac Trans Am is a true survivor car that is ready to make your adrenaline fueled dreams a reality. It features a strong, athletic styling that has become an icon of muscle cars everywhere. It is dressed in its original white paint that is accented by a beautiful blue bird decal on the hood and complemented by an exceptionally clean light blue interior. Powered by a 403 Oldsmobile V-8 engine that is mated with automatic transmission, this handsome devil is eager to get out on the road for a proper display of performance and power. With only 30,920 original miles you can rest assured that this Pontiac Trans Am will inspire your love of all that is fast, fun, and fierce for many years to come! The Pontiac Trans Am was built from 1967 to 2002. This 1979 is a second generation Trans Am that has been outfitted with T-Top glass. It comes with T-Top covers that are still in great shape, as well as the Space Saver spare and air canister which are still in the trunk! This survivor car comes with the original tires, window sticker, and build sheet which adds value to its classic authenticity. With the convenience of power locks this stunning Trans Am is perfect for anyone who appreciates collectible classics. This '79 Trans Am is one of only 30,728 total units produced. This car has only had one owner and it was bought brand new. Very few of those cars are still on the road. Fewer still, is the number of road worthy drivers in such good, original condition such as this one. This 1979 Pontiac Trans Am has been very well maintained. It is a must see/drive to truly appreciate everything it has to offer. In fact, come see for yourself! You will agree that you cannot find another '79 Trans Am survivor in this condition for the asking price. Call today for more information on how you can get behind the wheel of this classic muscle car icon!! !